ATLANTA (AP) — How do the Atlanta Braves bounce back from this? How does Brooks Conrad get over this? Three errors by the 30-year-old second baseman — a bobbled grounder, a dropped pop fly, a grounder right through the legs in the ninth inning that allowed in the winning run — left the Braves on the verge of elimination in the NL division series. San Francisco, which was on the ropes itself after giving up Eric Hinske's two-run homer in the eighth, bounced back in its final at-bat with two runs for a 3-2 victory Sunday, the most gut-wrenching game yet in a series that has been tight and tense all the way. "I've never experienced that range of emotions on a baseball field," Braves outfielder Matt Diaz said. The Giants are up 2-1 in the best-of-five series and can wrap it up Monday. Conrad might have to watch that one from the bench. Asked whether he would put the shell-shocked infielder back in the lineup, manager Bobby Cox would only say, "I'll have to sleep on it." The Braves could go with Troy Glaus at third, a position he's hardly played this season, and move Omar Infante to second base, where Conrad has been playing. Or they could go with little-used rookie Diory Hernandez at second. Conrad sure sounded in no shape to go back out there after tying a postseason record for errors in a game. "I wish I could just dig a hole," he said, "and sleep in it." Everyone felt for Conrad, even the team that benefited from all his miscues. Just listen to Buster Posey, who hit the hard grounder that resulted in Conrad's third error: "I thought he would make the play. I wouldn't wish that on anybody." While the Giants celebrated their win in the visiting clubhouse, senior adviser for baseball operations Tony Siegle worried about the guy on the home side. "How is Conrad?" Siegle asked a reporter. "I feel so bad for him over here." Conrad's teammates tried to console him, remembering that he was a valuable contributor off the bench this season, his first full year in the big leagues. His biggest hit came in May, when he hit a pinch-hit grand slam that capped a seven-run ninth and gave the Braves a 10-9 victory over Cincinnati. "We love him more now than we ever have," said Tim Hudson, who pitched seven strong innings in a great duel with San Francisco's Jonathan Sanchez. "We wouldn't be here without him." Giants manager Bruce Bochy left himself open to criticism by going to the bullpen after Sanchez had allowed only two hits in 7 1-3 innings and led 1-0. Sergio Romo served up the pinch-hit homer to Hinske, giving the Braves a 2-1 lead and needing only three more outs to gain the upper hand in the series. "To come back like that after a two-run homer in the bottom of the eighth, I mean, that can take the wind out of your sails," Bochy said. "And these guys came right back and found a way to get it done. That is a great win." And a horrendous loss for the Braves, ranking right up there with Game 4 of the 1996 World Series when Jim Leyritz hit a three-run homer that helped the Yankees pull out an 8-6 victory in a game Atlanta led 6-0. It also brings Cox within one loss of retirement. He announced more than a year ago this would be his final season, and the Braves rewarded him by making the postseason for the first time since 2005. But Atlanta has a number of key players on the DL, leaving a depleted lineup that is batting just .165 against the Giants. 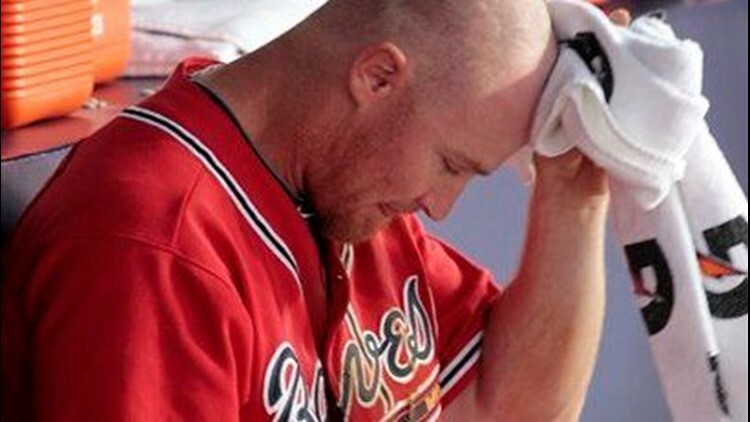 In fact, Conrad is starting only because Chipper Jones and Martin Prado went down with season-ending injuries. That didn't lessen the sting of Game 3. "We had this one won," Cox said. "We're not the best team in baseball, OK, but we can win games and we can compete against anybody. But we can't afford to make mistakes." The outgoing manager might be regretting a couple of his own decisions. With closer Billy Wagner out for the series after pulling a side muscle — yes, another injury — hard-throwing rookie Craig Kimbrel took over in the ninth trying to protect the one-run lead. He got Cody Ross on an infield pop and struck out Andres Torres, sandwiched around a walk to pinch hitter Travis Ishikawa. Freddy Sanchez was down to his last strike before he singled to center to keep the inning alive. With left-handed Aubrey Huff coming up, Cox decided to call in another rookie, lefty Mike Dunn. But Huff actually hit for a higher average against lefties during the season, and he came through with an RBI single to tie the game at 2. Posey followed by ripping a grounder straight at Conrad, who backed up slightly, then failed to get down his glove. The ball kept right on going into center field while Freddy Sanchez raced home with the go-ahead run. Conrad had already made two errors in the game, the second of which allowed an unearned run, and he now has eight in the last seven games. Hernandez was on the bench as a possible defensive replacement, but Cox said he didn't want to put in the rookie because he might be needed in extra innings. Turns out, the game never got that far. The Braves will send Game 1 starter Derek Lowe to the mound in the must-win game on just three days' rest. The Giants might have countered with Tim Lincecum if they were in the same situation, but with a 2-1 lead they'll rely on 21-year-old rookie Madison Bumgarner. Lincecum will be ready for a possible Game 5 — or the opener of the NL championship series against two-time defending NL champion Philadelphia, which advanced with a sweep of Cincinnati. If the first three games of this series are any indication — all were decided by one run — it should be another nail-biter Monday night. Bochy and his players are used to it. "They call it Giants baseball torture," the manager joked. "It's the way we play, a lot of tight games. If we play enough of them, guys get accustomed to it. They know how big every pitch, every play, every at-bat is."